Nature Seychelles invited me to provide bird ringing training course on Cousin Island, Seychelles, from 18-23 September 2011. The training was mostly mist-netting of seabirds and land birds. A total of 478 birds was caught (including recaptures). The most captured species were Lesser Noddies, Seychelles Fodies, and Common Noddies. Seychelles Fodies ringed in 2002, and a Common Noddy ringed in 2005, were recaptured. See the trip report, photos, and ringing totals here. Acknowledgements: Nature Seychelles is thanked for funding my visit. Riaz Aumeeruddy, Nature Seychelles, is thanked for organising all the logistics of my visit. 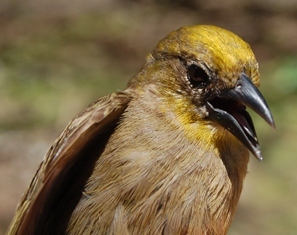 The Seychelles Warbler team (Martijn, Sjouke, Dave) is thanked for their help.